The 4th annual Disability Conference which took place from 8-9 September 2015 in Pretoria, saw a number of keynote speakers exploring the tools, technologies and systems for creating accessibility for people with disabilities in the workplace. The annual Disability Conference, hosted by Progression, a specialist in the field of disability, aims to encourage companies to explore the core aspects of disability and provides a platform to build capacity, share success stories, challenge belief systems and learn practical tools to tackle disability matters in the workplace. Each year, the conference focuses on a different aspect of disability management. Because persons with disabilities are often not considered in employment due to negative perceptions regarding their ability to contribute, the perceived high cost of accommodating their disability or inaccessible workplaces, this year’s conference examined Reasonable Accommodation and how it can promote accessible and inclusive workplaces. “Reasonable Accommodation is a term known by many but often misunderstood. Most employers accept their responsibility to employ and promote people with disabilities but fall short when considering the adjustments or modifications which may be required to ensure the successful and fair participation of an employee with a disability,” says Julia Wood, Progression’s Organisational Development Manager and conference project manager. Speakers from a variety of backgrounds challenged delegates to examine some of the key misconceptions and challenges around Reasonable Accommodation, and how true accessibility in the workplace can ultimately unlock potential and create an environment in which all individuals can grow and participate. Highlights from the event included an insightful talk from Nazereen Bhana, Director at eDeaf, who unpacked what employers need to know about employing people who are deaf, and how the various services offered by eDeaf such as their sign language training and interpreter retainer packages can support employers and employees to ensure an inclusive working environment. Delegates were further motivated by Jermaine George - a third year music student at Wits as well as part-time songwriter, composer and music producer - who gave an insightful talk on ‘a day in the life a person who is blind’ including some of his everyday experiences and barriers in his environment. Various software and assistive devices were demonstrated by Jacques van Zijl, Technology specialist at Microsoft SA, and Danny Havenga, Director at Microlink PC South Africa. Both presentations highlighted that inclusion and accessibility does not have to be costly - as many of the products are available for free. “This was a fantastic presentation. I was amazed at the products on offer. Has it always been that easy to integrate these skills?” commented one delegate. Day two of the event featured a practical, hands-on activity for delegates who were asked to use what they had learned to ‘build’ their own reasonable accommodation solutions for a variety of scenarios. The second half of day 2 was dedicated to environmental accessibility. Delegates were asked to consider the accessibility of both the internal and external environmental layout of their workplaces. Hiten Bawa, Architect and Universal Access Consultant guided delegates through the principles of Universal Design and what the minimum requirements are as per building legislation. Keshika Naidoo, Occupational Therapist for Progression then proceeded to unpack for delegates how to conduct an environmental accessibility audit. “The presentation was very informative and provided good examples of why an environmental accessibility audit is necessary,” commented a delegate. Other speakers included Derick Gerber, Director at BAS4 Financial Services who explained the various financial considerations around disability in the workplace, with specific reference to tax implications. Justene Smith, Disability Specialist at Progression unpacked some of the less ‘visible’ disabilities as she explored both the symptoms and barriers experienced by people living with cognitive, psychiatric and/or neurological disabilities. And lastly, an insightful case study was presented by the Employment Equity team at SABC as Shenda Moses and Wendy Ndlovu explained, from an employee and employer’s perspective, how they approach reasonable accommodation. “What made this year’s event special was the amazing line-up of speakers, many of whom have disabilities themselves. By including information about physical, sensory and mental disabilities, as well as reasonable accommodation solutions which are freely available or can be purchased by employers, we ensured that delegates walked away with many options to explore,” said Julia. Over the two days, the conference challenged perceptions and assumptions about disabilities and both organisers and delegates alike expressed their confidence in the value of the presentations. 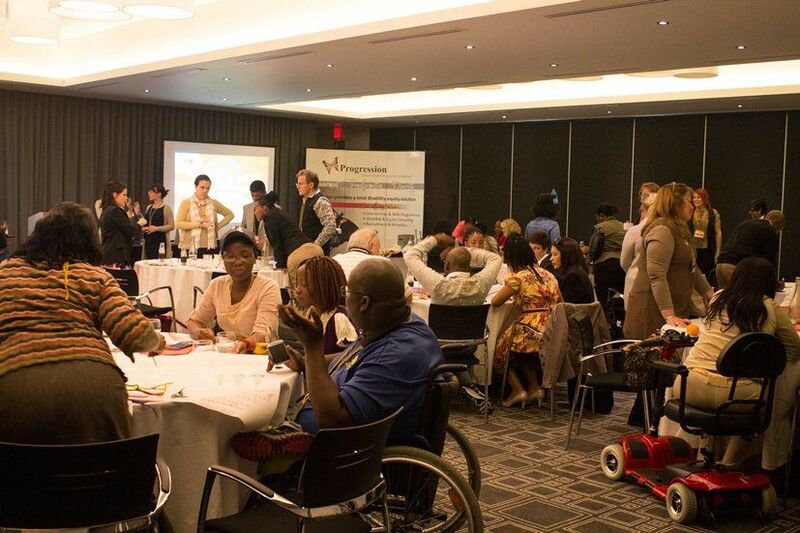 Progression, who has assisted corporate South Africa to manage disability for more than 12 years, hopes that this and future conferences will bring about true transformation in inclusion for those with disabilities.